The attachment is my comment on an article published in the ‘SATHYADEEPAM’ Malayalam weekly dated 25-11-2009, based on a statement of the then Pope with regard to the relationship of the Artists and the Church. 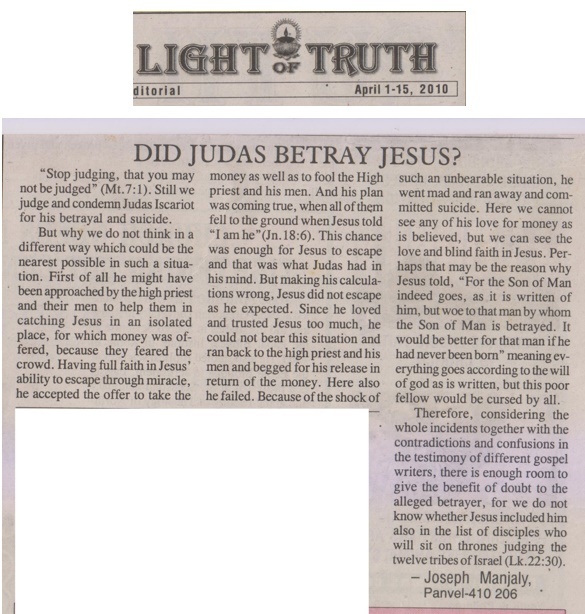 It is given here mainly to show how people are interpreting wrongly without understanding the purpose and circumstances particularly with reference to Judas Iscariot in continuation to my earlier post. The published matter is roughly translated as follows: “ The statement of the Holy Father was not with reference to the Church Construction. On the contrary it was made when he was addressing the Artists. Hence it cannot be taken as justifying the extravaganza on the church construction of the medieval period also known as dark ages. Those churches are standing today as museums rather than churches. "Stop judging, that you may not be judged (Mt.7:1). Still we judge and condemn Judas Iscariot for his betrayal and suicide. But why we do not think in a different way which could be the nearest possible in such a situation. First of all he might have been approached by the high priest and their men to help them in catching Jesus in an isolated place, for which money was offered, because they feared the crowd. Having full faith in Jesus’ ability to escape through miracle, he accepted the offer to take the money as well as to fool the High priest and his men. And his plan was coming true, when all of them fell to the ground when Jesus told “I am he”(Jn.18:6). This chance was enough for Jesus to escape and that was what Judas had in his mind. But making his calculations wrong, Jesus did not escape as he expected. Since he loved and trusted Jesus too much, he could not bear this situation and ran back to the high priest and his men and begged for his release in return of the money. Here also he failed. Because of the shock of such an unbearable situation, he went mad and ran away and committed suicide. Here we cannot see any of his love for money as is believed, but we can see the love and blind faith in Jesus. Perhaps that may be the reason why Jesus told, “For the Son of Man indeed goes, as it is written of him, but woe to that man by whom the Son of Man is betrayed. It would be better for that man if he had never been born" meaning everything goes according to the will of god as is written, but this poor fellow would be cursed by all. Therefore, considering the whole incidents together with the contradictions and confusions in the testimony of different gospel writers, there is enough room to give the benefit of doubt to the alleged betrayer, for we do not know whether Jesus included him also in the list of disciples who will sit on thrones judging the twelve tribes of Israel (Lk.22:30).